A little while ago I was offered a copy of an E-book to review. Aimed mostly at hikers and backpackers, Trail Chef contains 100 recipes derived from popular recipe’s you might expect to cook at home. The book is divided up into 7 sections. Snacks, Breakfasts, Soups, Main Courses, Desserts & Baked Goods, Drinks and finally Menu Plans. The recipes are adapted from some favourite home recipes to suit trail conditions, making them lighter, easier to cook, requiring less ingredients and of course substituting perishable ingredients. Each recipe has very handy at-a-glance statistics showing how many it feeds, difficulty level, total weight of ingredients (important for backpacking! ), number of calories, time needed to make the meal on the trail and what cooking gear you will require. 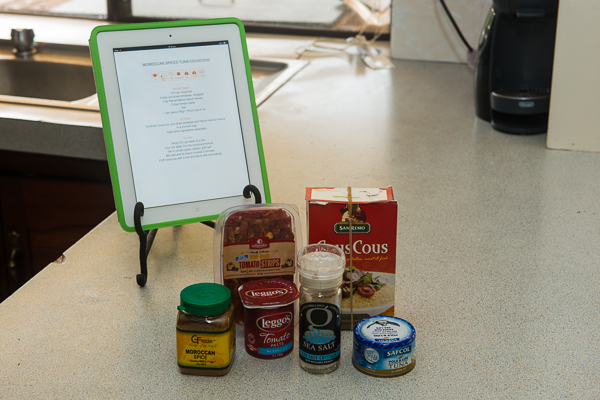 Of course, what good is a cook book review without trying out a recipe? 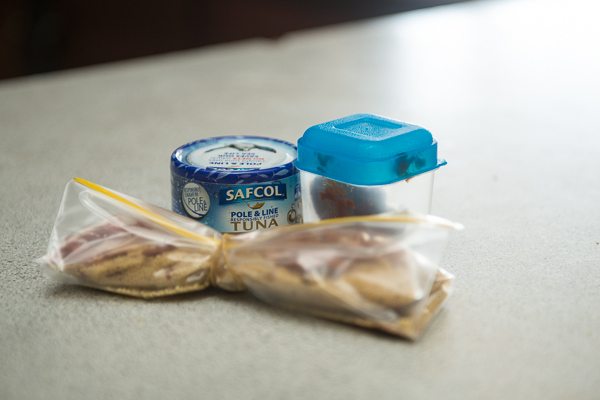 After a good flick through I decided to make the Moroccan Spiced Tuna CousCous (Page 70) for my lunch. This recipe has a difficulty rating of ‘super easy’, only required one pot, a prep time of 10 minutes and listed a lot of common ingredients that I knew I would easily get my hands on. One thing I should mention is that the recipes use a few ingredients that are either hard to find in my usual supermarkets, or just have a different name. This recipe actually called for “Ras-el-Hanout’ spice mixture which I couldn’t find, so I appropriately substituted moroccan spice instead. The idea is that you prepare everything in the kitchen at home, and finish it off when you’re out on the trail. It took me 5 minutes to combine the required ingredients and package them into this tiny bundle that would shortly become my trail lunch. As I have never cooked while hiking, I don’t own a hiking stove. 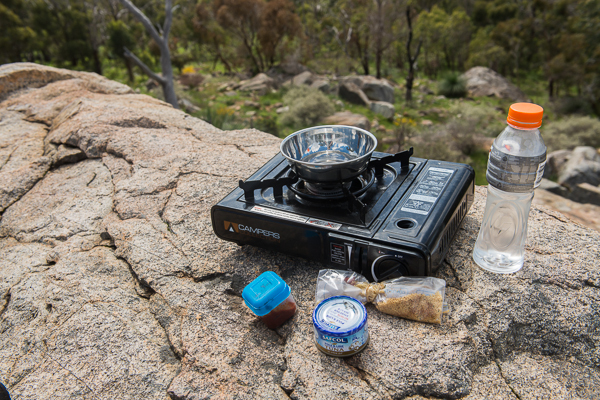 So I lugged my butane cartridge stove into the bush and prepared my meal on a rock. It was a very enjoyable experience actually. Making my lunch involved heating some water, adding the couscous and letting it soak and then just add the remaining ingredients and heat it up! I’m wasn’t sure what to expect from this meal. It seemed too simple to be tasty. I sure didn’t expect to enjoy it as much as I did! 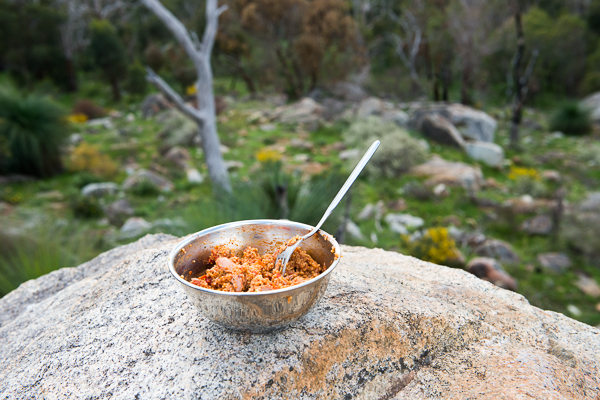 Who’d have thought that you could have more than muesli bars and trail mix out on a hike? Probably everyone except me, but I’m a convert now! If you are interested in getting a copy of Trail Chef, it can be had for $6.99 on Itunes, Amazon and Kobo as an E-Book download. For further information take a look at the TRAIL CHEF WEBSITE .